Keep in mind that last summer was one of the better summers for me to be Asian. I grew up across the world from my extended family and away from other Asian kids who had close ties to their own cultural backgrounds. Couple that with the fact that it wasn’t cool to be Asian when I was a kid—the first and last time I spoke Chinese in front of my friends, I got made fun of. I spent much of my childhood and adolescent period either not knowing where I came from, or running from it. The majority of my cultural identity came from how hard I could throw a dodgeball, or something dumb like that. I’d been out of that town for two years by then, in a place with a closer-knit Asian community. I felt Asian for the first time. 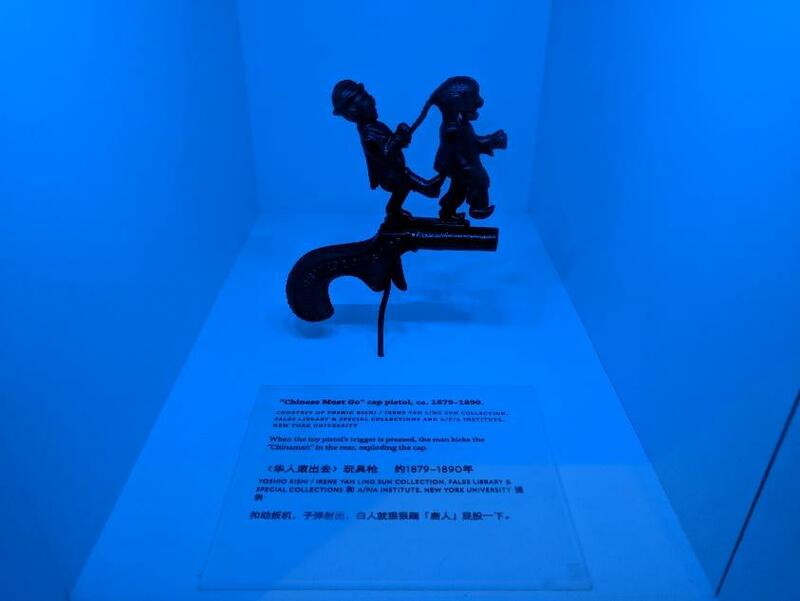 Knowing this, maybe you can see why I chose to go to the Museum of Chinese in America after deciding I was irretrievably late to a work barbecue on the southern tip of Manhattan (the details of which are to be kept private, pursuant to the confidentiality agreement that I signed). I walked to Chinatown. The Museum of Chinese in America greets its visitors with a sign above its door that says “MOCA,” one of the better museum-name-abbreviations I’ve seen in my time. On a sunny day with the light pouring into the windows, you can’t really tell if the museum is open or not. That’s because most of the lighting is meant to highlight the various artifacts and pieces of historical context, and general visibility seems to be more of an incidental byproduct of this. I bought a ticket and looked around, waiting for my eyes to adjust to the darkness. 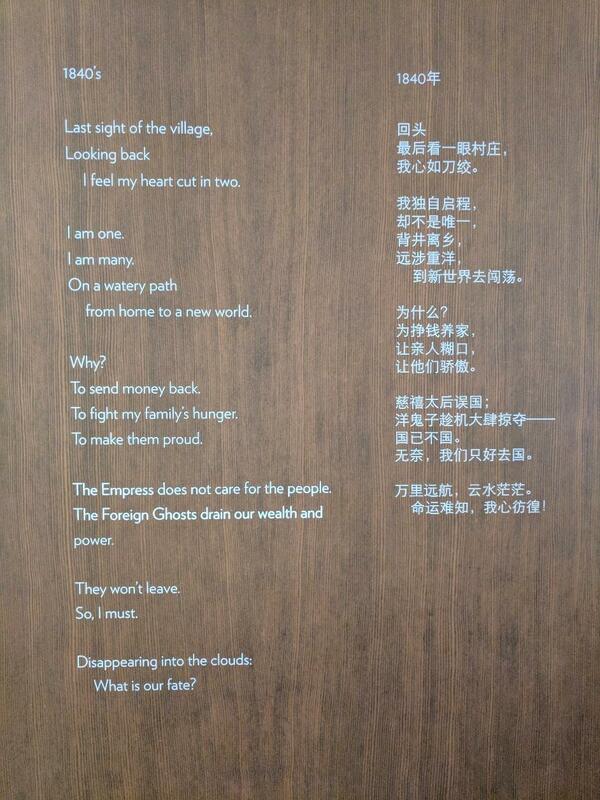 But thinking more positively (debatably, and by a narrow margin), there was a poem written on the wall of the immigration exhibit. “Last sight of the village, / Looking back / I feel my heart cut in two,” it began. I thought of my parents, who elected to come to the US together after they finished school in China. They left everything they had back in their home country—family, friends, connections, culture, native language—and didn’t have the money to return to China for more than ten years. All this, in order to create a better life in a country that didn’t even want them here for over a century. Never mind the comfort zone. Every now and then I’ll see a family from China walking around Boston Common, with a toddler stumbling around. While the toddler is trying to work through its early stages of fine motor development, I can see in their parents’ eyes that they’re working through their own issue, slowly piecing together where they even fit into this weird new world that surrounds them. It’s things like this that remind me how much I owe to my parents. They didn’t leave everything behind for me to slack off and let my life slip through my fingers. The poem ended with “Disappearing into the clouds: / What is our fate?” It’s a hard question, but I feel like I’m sharing something with these other families I see, crafting their own answers. The picture was grainy. Black and white. There were two men in the foreground, one squatting with his heels completely on the floor, the other eating rice from a ceramic bowl and looking over at his friend. The bowl, I noticed, had a pattern printed on the side, which I’m 99% sure was blue in real life, drawing from my partial knowledge of Chinese ceramics. I have to say I never figured out why the guy stared for so long. Maybe he saw another guy a few minutes before him, looking at the photo for an uncomfortable amount of time as well. 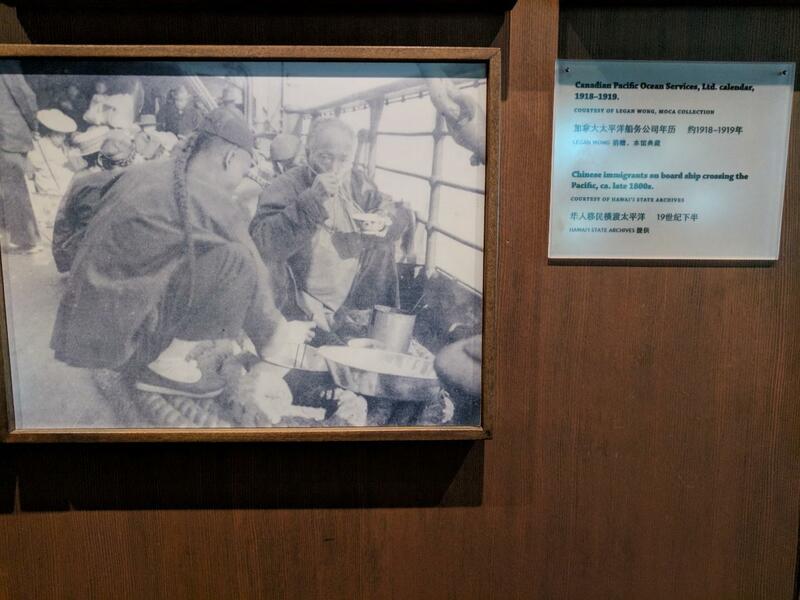 But the thing is, I stared at the photo for a long while too, the reason for which I’ll try to put into words: if you took a look at the old man eating rice from the presumably blue bowl and told me “this is your grandfather, this is you,” I might even believe it.